Freechoice: Visit the History Museum and Hoa Lo Prison, or join an authentic cooking class. Alternatively, visit Ho Chi Minh Quarter and Mausoleum, including a visit to the Temple of Literature. Begin the day with a Tai Chi lesson. Cruising deeper into the National Park, try some kayaking, explore a cave and discover Cat Ba Island. Relax during your morning cruising before returning to Hanoi for another Special Stay and a historical bunker tour at the hotel. Freechoice: Discover Banteay Srei and visit the Landmine Museum or admire the skills on display at Artisans D’Angkor. Alternatively, cruise on Tonle Sap (seasonal), take a tuk tuk ride to all the markets or take a tethered balloon ride above Angkor Wat (weather dependent) before visiting a Pouk Silk Farm and Preah Khan Temple. Later visit the colossal Angkor Wat. Marvel at sunrise over the magnificent Angkor Wat before moving to a special location for a champagne breakfast with food prepared by an NGO supported local bakery school. Visit the atmospheric, jungle covered Ta Prohm Temple, before stopping at Angkor Thom and the multi-faced Bayon Temple. The remainder of the afternoon is at leisure. Awake as you approach Wat Hanchey, an ancient hilltop pagoda and monastery to meet the resident novice monks. Walk (or drive) to the top for some of the best elevated views of the cruise before sailing downstream to Kampong Cham. Upon arrival in Angkor Ban, explore its historical rural wooden houses, which survived the Khmer Rouge, and visit the local pagoda to observe the lifestyle of the resident monks and nuns. Receive a blessing from a monk and learn how to pray in a Buddhist pagoda, before partaking in a ceremony which contributes to the daily meal of the resident nuns and monks. Later sail downstream to Koh Dach island dedicated to the art of silk weaving before continuing your cruise to Phnom Penh. Enjoy a cocktail reception on the Sun Deck against the backdrop of Phnom Penh’s lights as the ship sails towards the capital at sunset. Freechoice: Journey to the Killing Fields and tour Tuol Sleng, or join a hands on Khmer cooking demonstration. Alternatively, explore by tuk tuk Phnom Penh’s colonial buildings, the Central Market as well as the city’s modern architecture. Freechoice: Stay in Tan Chau to visit Evergreen Island and enjoy a ride in a Xe Loi. In Chau Doc visit a family-operated fish farm before walking through the local market or visit Tra Su Bird Sanctuary. Immerse yourself in the historic town of Sa Dec and explore the lively market. Stop for a green tea at the home of Mr Huynh Thuy Le who inspired Marguerite Duras’ novel L’Amant. Freechoice: Visit Cai Be before stopping at local cottage industries and a traditional house in the area. Alternatively savour afternoon tea at a French colonial house or choose to stay on board and learn how to make cocktails. 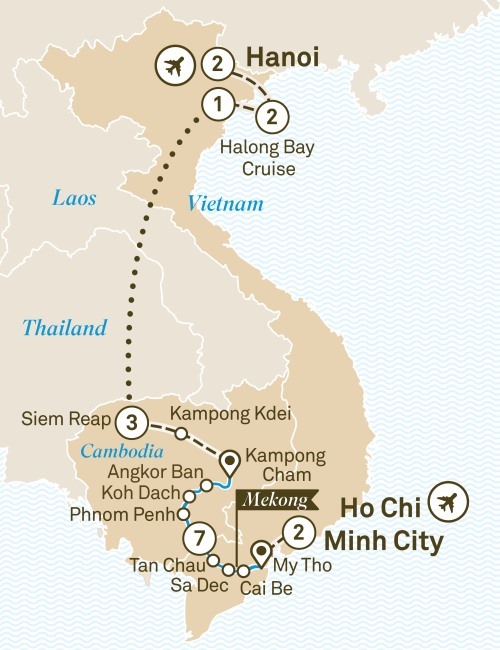 Drive to Ho Chi Minh City and the Intercontinental Saigon, your centrally located hotel for the next two nights. On arrival, take an orientation tour around the post office and cathedral next door. Sail deep into Halong Bay, sample Hanoi's hidden food haunts,discover the allure of Phonm Penh, uncover the secrets of World Heritage-listed Angkor temples. Sail deep into Halong Bay on a two night cruise and sample Hanoi’s hidden food haunts after dark on the back of a vintage Vespa, while in Siem Reap, uncover the secrets and allure of the World Heritage-listed Angkor temples through exclusive Scenic Enrich events. Enjoy the thrilling wonders of Halong Bay, before you travel to Cambodia to explore the heaven on earth that is Angkor Wat and embark on your Mekong river cruise. Journey from quaint upriver stilt houses to the allure of Phnom Penh, before cruising back into Vietnam.